Don’t be alarmed now, I’m a knifenut but not one of those that you’d cross the street to avoid. I mean I’m a kitchen knifenut, particularly Japanese kitchen knives. If you see me with one of these then you can rest assured I’m planning nothing more violent than a nice meal. Knives are important to a Foodist. Unless you think you can flutter your eyelashes and food magically prepares itself like on TV then you have to accept that being good with knives makes cooking a lot easier. In my kitchen, apart form the eating, prepping is the most fun. That’s because I have really nice knives that I love using and more importantly I like sharpening them. It’s no good having a sharp knife if you can’t keep it sharp! Being Chinese, I started off using cheap stainless steel Chinese chefs knives or cleavers. As interest in cooking Western dishes grew I bought Sabatier style chefs knives, but I was never happy with them. They were never really sharp, using that rocking style of cutting food, stuff tended to get crushed into the desired shapes. If you have a blunt chefs knife you’ll know what I mean. So when I bought my first Japanese knife almost ten years ago it was a revelation. Ironically it was a Chinese cleaver but made by a Japanese company using Japanese steel and techniques. What is so special about Japanese knives? Foremost the people who make them. Japan has the most enviable culture of artisan craftsmanship in the world. Knife making there has had centuries of refinement and innovation. The secrets of samurai sword making passed into knife making after the final Shogunate was dissolved. The best knives are worked on by three master craftsmen; forger, polisher and handle maker. It’s not just a bearded bloke with tattoos and good intentions in a shed with a grinding belt. I could go on and mention that Japan also has the best steel manufacturers specialising in kitchen knives. 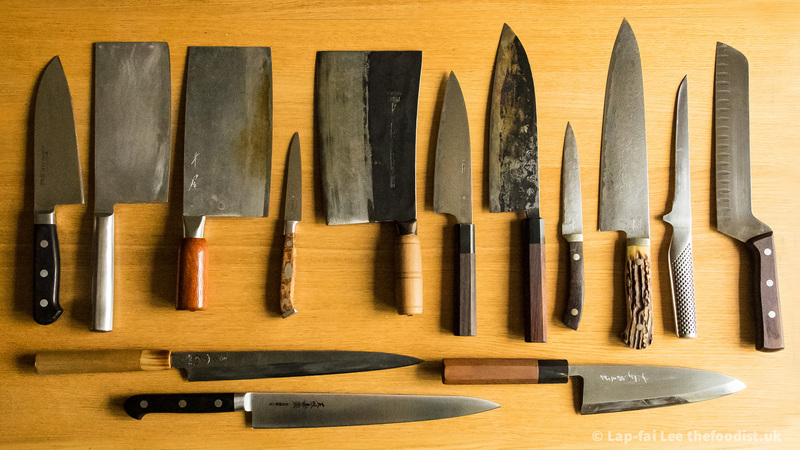 Every knife manufacturer in the world uses Japanese steel in their top-end designs now. Do I even need to bring up that Japanese cuisine demands meticulous precision? Japanese knives are more surgical scalpels than kitchen tools. Oh and some are also mesmerisingly beautiful functional works of art. Using a truly sharp knife for the first time changed my attitude to cooking and to what was possible in the kitchen. “Oh I can prepare all that veg no hassle, let’s eat more veg, I’ll pop out now and buy some!”, I started to say. Over the following weeks and months I cooked so more fresh food from scratch because prepping is enjoyable or at least more efficient and my skills improved to match the tools. Now at a drop of a hat I can and will make enough Asian slaw to feed a terracotta army and I never let the butcher score my crackling! So do you want to join in the fun? Take a look at Japanese Chefs Knife, Japanese Knife Company, Cutting Edge Knives or Kataba and get in contact with me if you need independent buying advice. If you’re already a knifenut and you need your knives resharpened then I can make that edge sharper than it was out-of-the-box. That factory edge is never as sharp as it can be, get in touch and I will prove it to you. Hi – great knife work. Quite a collection of top blades and interestingly none of them serrated. Top tip; a Stanley knife for scoring crackling still works well in an emergency. Btw, how much is that whetstone and where can I find one? Thanks again for sharpening my knife, makes a world of difference, definatley would like a lesson at some point. Sure thing, just wait for your knife to to need sharpening again and we’ll get together. Pingback: Takeda AS Gyutou, 10 Year Review | The Foodist. Hi Lap-fai, if I can add something to the discussion, then with knives, like with almost anything crucial which we buy – it really depends on person’s budget and purpose of use. While I can’t give an opinion about Western type knives, I know a lot about Japanese ones since I run a shop with handcrafted Japanese knives. If you are looking to spend no more than 100 GBP, I would highly recommend Moritaka brand, their super steel aogami series is very affordable (you can get Nakiri for around 90 GBP) and very, very sturdy (despite being quite light!). 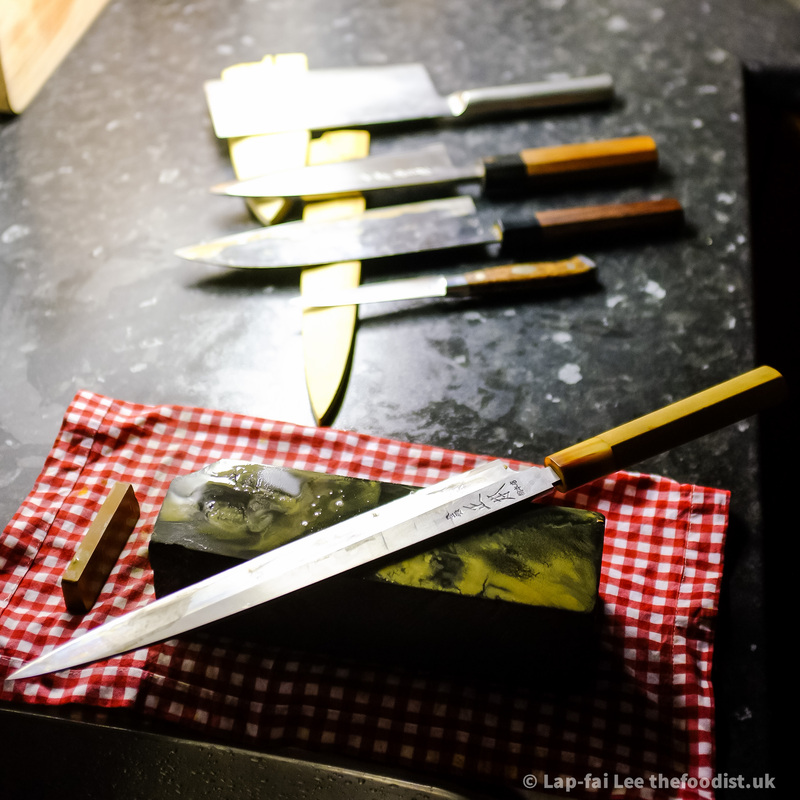 Our clients who are professional chefs tend to choose R2/SG2 steel knives, Sakai Takayuki and Yu Kurosaki are their favourite blacksmiths but these are a bit more expensive – you would have to spend around 150-220 GBP for a decent Gyuto. A while ago I’ve written a guide to choosing the right knife for a person’s needs https://japana.uk/how-to-choose-the-right-knife/. Good luck to everyone and happy knife hunting!